Miami Marlins manager Ozzie Guillen walks to the dugout after a pitching change during a baseball game against the Arizona Diamondbacks in Miami, in April. Former Cub Carlos Zambrano now playus for his friend--Ozzie Guillen. Welcome back to Chicago, Ozzie Guillen! Welcome back to Wrigley Field—the ballpark that drives you crazy! Your return is met with clear lines drawn… between your lovers and your haters. It would seem there is no in-between for baseball fans in Chicago. On Tuesday, the Cubs host the Miami Marlins to start a three-game series. There are a few storylines, but none bigger than Guillen’s return (unless he went to the South Side). The brightest and likely the most attention-getting star this series is Guillen—now the skipper of the Marlins. The Florida team has spent a ton of money in the free-agent market for Jose Reyes, Heath Bell and Mark Buehrle, but they have not yet lived up to the payroll. Early into his managing stint in Miami, Guillen found himself in hot water with his comments to Time magazine about Fidel Castro. He was suspended and has offered an apology to the state&apos;s large Cuban community for his statements. Guillen’s time with the White Sox can be described as colorful and controversial—with a World Championship. Although, you would also have to sprinkle in a few profanities to emphasis any point. When Ozzie Guillen was first hired here in 2004, he came into the job without managing experience but had been coaching third base for the Marlins. Since there were only a few reporters (myself being one of them) remaining from his playing days, we knew what he was like as a player and wondered how this brash, baseball-smart man would be as a manager. He turned out to be a pretty good one. His flaw of talking without a filter and some Tweets, sent by his son, would cause a rift between Ozzie and Sox General Manager Ken Williams—as well as the team. Guillen had to undergo sensitivity training when he used a gay slur about Sun-Times columnist Jay Mariotti. His middle son, Oney, tweeted some harsh sentiments about Williams and former Sox pitcher Bobby Jenks. To the regular media, Ozzie Guillen would be engaging to talk to during the pre-game and post-game media sessions. There is not an “off button” for Guillen’s mouth. Sometimes he would take stands on a player or take all the negativity onto himself and deflect it from his club. It was fun to disagree with him on a player or world events. Pick any topic! He loves the late, great Roberto Clemente, but proclaimed Robbie Alomar was the greatest player from Puerto Rico. Guillen had never seen him play. I did many times. The “discussion” would last for a while. and their media have Guillen. There are a few other familiar faces on his staff and roster. When Guillen left the White Sox, the only coach he took with him to South Beach was Joey Cora as his bench coach. Cora has long been the most important confidante for the colorful manager. Two former Chicago players are part of Ozzie Guillen’s starting pitching staff. It is always odd when a player changes uniforms after a long career with one team and that is certainly the case with former White Sox lefty Mark Buehrle. He left after becoming a free agent last season for a hefty $58 million for 4 years. Buehrle was a member of the 2005 World Series team. Fans will never forget him coming in to save game three of the 7-5 win in the 14th inning marathon. He also thrilled baseball fans with a no-hitter and a perfect game. Right now, he has an 9-8 record in 18 games started with a 3.13 ERA and as always has already pitched 120 inning at this point. His durability has been a key to his long, 13-year career; he has thrown 200 or more innings since his first full season in 2001. Buehrle is a three time Gold-Glover and a four time All-Star. He wasn’t just a work-horse for the Sox, he was a club house leader and one of the most affable players to play in Chicago. Buehrle will start against the Cubs on Thursday. While Buehrle was always known for his easy going temperament, Carlos Zambrano is quite the polar opposite. The former Cub was dealt to Miami after he was suspended for walking out on the team last August and never pitched against for the North siders. Zambrano seemed like he would be an ace for the Cubs and did throw a no-hitter Versus Houston (at Miller’s Park in Milwaukee). He did have 16 wins in both 2004 and ’07; his best year was 18 victories in 2007. When Theo Epstein took over the Cubs, one of his moves was to send the volatile Zambrano to Miami with the Cubs picking up about $15 million of the $18 million contract. They also got pitcher Chris Volstad. In other words: the deal’s net result was zero. But to the Cubs it alleviated a major headache. Ozzie Guillen has always had a soft spot for his fellow Venezuelan, what seem to gull Cub fans was their friendship was on display during a turbulent time in 2010. 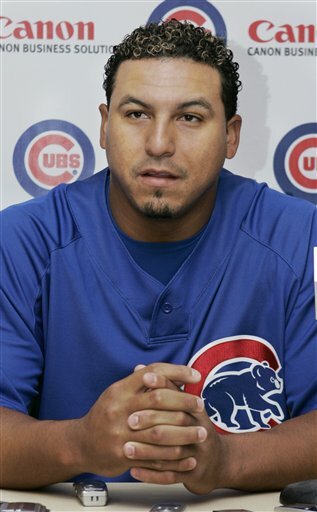 Zambrano had a huge fight with his former Cub first baseman Derrick Lee in the dugout at U.S. Cellular. That night Zambrano dined with the Guillen family which didn’t sit well with the Cubs fans or the team’s management. Bi g “Z” has had other confrontations once with catcher Michael Barrett and a Gatorade jug. Off the field, Carlos was a very pleasant player to talk and didn’t seem like the loose cannon he showed when on the mound. Presently, he is 4-7 with his new team with a 4.20 ERA…0 blow-ups. It will be interesting to see if White Sox fans will show up at Wrigley Field, or do they even care anymore? You never want to miss an Ozzie Guillen media session—even if he is managing a different dugout.